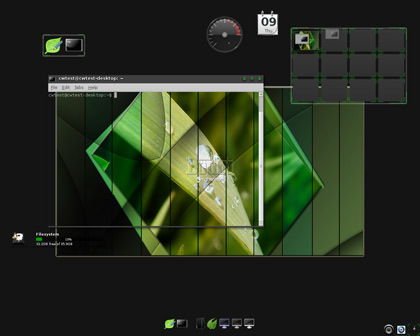 Bodhi Linux, version 1.0 of which was released in late March, is somewhat different to most YUADs: It uses Enlightenment 17 to provide a desktop environment. The distribution also has a philosophy at odds with many desktop-focussed distros. It provides a minimalist installation that will appeal to people who like to endlessly tinker with their desktop setups. The creators state that they believe in "User Choice, so we don't give you three pre-installed mail clients to choose from. It does not mean that there is every browser possible at the click of a button. "What it does mean is that we have our own repositories and these are accessible via the apt-get command line, GUI package manager or better still our on line software store." In that sense it's comparable to something like CrunchBang Linux: It can keep out of your way and let you get on with tweaking everything to your liking. But, unlike CrunchBang, Bodhi runs Enlightenment. And Enlightenment offers an enticing combination: It's designed to be lightweight yet still appeal to all those who can't live without an eye-candy-filled desktop. As is common with most Linux distros, you can burn the ISO to CD or copy to a USB drive using a program like UNetbootin, then boot into a desktop environment. From here you can install it to the hard drive of your notebook or desktop PC. We tested Bodhi with both a Lenovo S10 netbook and a Dell Optiplex GX620 PC. Installation on both was straightforward, though initially at least the S10's touchpad wouldn't work (it worked during a second installation, however; this problem hasn't been encountered in the past, but may be a hardware issue). After installing and rebooting the OS it seemed fine. During your initial log-in you are able to select a profile — Bare, Desktop, Ecomorph, Fancy, Laptop or Tablet/Netbook — and then a theme. On the S10, we were underwhelmed by the default interface, despite selecting the Tablet/Netbook option. It felt too crowded by default, especially in comparison to CrunchBang or Peppermint Ice, both of which are distros we recommend looking at if you're interested in a netbook-friendly operating system. We also encountered hangs on shutdown, and errors when logging in again on boot. Installation also took significantly longer than some of the lightweight distributions installed on the S10 in the past. Only a minimum of applications are installed. 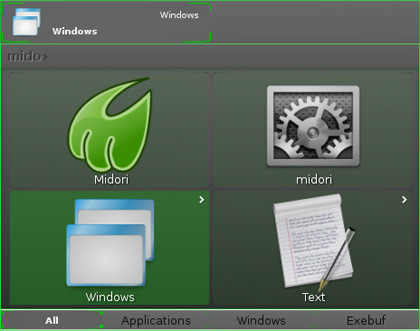 The lightweight Leafpad text editor is installed instead of an office suite, and by default you get the Midori Web browser instead of Firefox or Chrome. I have come to appreciate this approach a lot more than distros that throw in three of every kind of program you might want to run. Why bother when almost anything you could possibly want is just an apt-get install away? Errors are to be expected, given Enlightenment's ongoing development, and I encountered a number of them. I found myself, for example, having to close about a dozen dialogue boxes when the Dell PC started up. 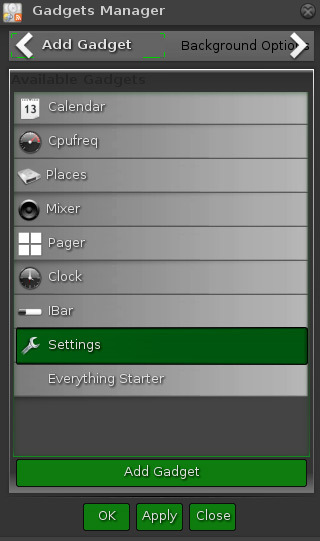 There are also quirks, such as submenus of menus up against the side of the desktop opening outside the desktop area (so you can't make a selection). But despite this, and despite the (shallow) learning curve, it's clear that Enlightenment has a lot to offer people who are after a desktop experience that is both rich and customisable. It comes with a range of desktop Gadgets, and there is a lot of scope to set your environment up so it's Just Right. Gadgets include a Mac-esque launcher at the bottom of the screen, a container object for icons, a virtual desktop pager, clocks, calendars and a CPU usage monitor. Special mention must be made of Run Everything: An extremely powerful and customisable launcher. At a basic level it provides quick access to your documents and installed applications. However, it is capable of much, much more; check out the Bodhi Linux wiki entry for more information. In the end we were somewhat underwhelmed by the end user experience though. Bodhi can be very pretty to look at, and you can make it even prettier if you take the time, but these days I find myself longing for super-minimalist desktops with a focus on staying out of the way (of course, Bodhi can be made to be this as well, if you are interested in learning the ins and outs of Enlightenment). The simplicity of the default installation is great — I don't like being overloaded with apps. But there was just not enough there to hold my interest — I'd rather install CrunchBang and customise Openbox. On the flipside: If you want to play with Enlightenment (and who doesn't like playing with new desktop environments) then by all means check it out. The Bodhi team has done a great job of creating a relatively friendly vehicle for playing with Enlightenment — it's just not for me. There is a new version of Bodhi Linux out: Version 1.1.0. Hopefully this will have addressed some of the quirks we encountered.